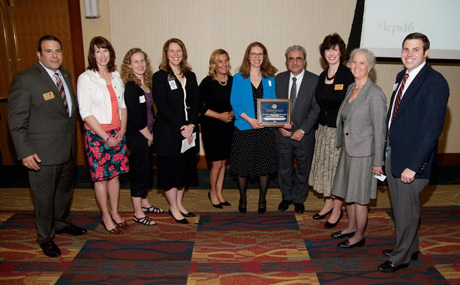 GW was honored to receive the Loudoun School-Business Partnership Award of Excellence for Service on March 11. The partnerships with Loudoun County Public Schools (LCPS) began more than 15 years ago and have expanded to include close working relationships with the art and science departments. Thousands of LCPS students and teachers have benefited from exposure to new experiences and hands-on learning, especially in STEM-related fields. These partnerships reflect GW’s long-term commitment to community engagement and are closely tied to the university’s educational mission and core values. Loudoun School Business Partnership Executive Council’s mission is to “promote the development and success of partnerships between the LCPS and businesses to ensure that the students are prepared to contribute successfully to the ever-changing business and community environments.” The Council received 240 applications this year, with only five receiving the 2016 partnership awards. GW’s Virginia Science & Technology Campus was recognized for multiple partnerships, which began as early as 1999. The university was nominated for the award by Odette Scovel & Jennifer Chang, LCPS Science Department and Melissa Pagano, LCPS Art Department. Each partnership is unique, but overall they have provided wide-ranging experiences and resources to thousands of LCPS students and teachers. GW’s oldest partnership with LCPS, the Young Artist Series, has provided exhibit space featuring all ages of LCPS student artwork year round since 1999 and hosts “Meet the Artist” receptions to honor the student artists and teachers. The partnership developed to further encourage young people to pursue artistic endeavors and to help support the fine arts program in the local schools. The Campus has also hosted teacher art exhibitions and in 2016 will host the LCPS Scholastic Art Gold Key Exhibition, a juried show for students in grades 7-12. “I have had the pure joy of seeing the smiles, and hearing so many families talk about what an amazing opportunity their child was given to participate in such a great art exhibition at GW. On behalf of the art team, I want to thank GW for partnering with us for two decades to celebrate young artists across our county. With this partnership, thousands of our children have had the opportunity to share their voices through their art. I look forward to continuing our partnerships and celebrating so many more creative children in our schools,” said Melissa Pagano, art supervisor for LCPS. Partnership Participants: Melissa Pagano, LCPS and Dova Wilson, GW. Support was also provided by Andrea Barnes, GW and other staff. GW’s partnerships with the LCPS science education office are also long-standing, with the 10th annual Science, Technology and Engineering Day taking place in several weeks. This partnership, launched in 2007, captures students' imaginations while teaching them about STEM-related career opportunities. Over 150 LCPS high school students spend a day annually on GW’s campus experiencing unique hands-on workshops designed to illustrate different areas of academic study, research, and careers in the fields of science, technology, and engineering. Participating GW schools include: the School of Engineering and Applied Science, School of Medicine and Health Sciences, School of Nursing, Milken Institute School of Public Health, Columbian College of Arts and Sciences and the College of Professional Studies. Partnership Participants: Odette Scovel, LCPS; Jennifer Chang, LCPS; Joan Ziemba (founder, deceased); Paula Harper, GW; Dova Wilson, GW; Andrea Barnes, GW; Judy Mancuso, GW and many others. “I am honored to recognize the significant contribution that the GW Virginia Science & Technology Campus makes to our schools, teachers and most importantly to our students. In the many programs and projects in which we collaborate, including Science, Technology and Engineering Day, Teachers in Industry, Genomic Opportunities for Girls in Research Labs (Go Girls) and sponsorship of Young Scientist Awards at the Regional Science & Engineering Fair, VSTC serves as both a bridge and a catalyst. They connect students to unique real-world experiences and ignite a passion for STEM opportunities right here in Loudoun County,” said Jennifer Chang, LCPS science specialist. The university has great fun working with students, but sees equal value in partnership programs that cater to continuing professional development for adults, such as the GW Teachers in Industry Project (GWTIP). Launched in 2009, GWTIP is an initiative to provide LCPS middle and high school core content teachers the opportunity to experience firsthand the work environment for which they are preparing their students. Externship experiences at top regional businesses allow teachers to become aware of the core knowledge and skills needed to be successful in the STEM-focused 21st century. This unique industry education partnership has served nearly 150 teachers and counts more than a dozen businesses as dedicated partners. Co-directed by Paula Harper, GW and Dr. Janet Schiavone, GW, local industry partners currently include: Rehau, Telos, Inova Loudoun Hospital, Loudoun Water, Loudoun County Government, Dulles Airport, Aol, Siemens and K2M. The VSTC also annually supports the Young Scientist Awards presented at the LCPS Science Fair, Job For A Day, and provides access to space and support facilities for school retreats and teacher professional development. GW is honored to be recognized for its’ partnership efforts with LCPS; however the real value for the university is in knowing it has helped expand the minds of students and teachers. The Campus looks forward to continuing its’ partnerships for many years to come.